The South Sea Pearl Studio speculates about the possibility of self-sustainable urbanism that balances and integrates the aims of culture, nature and business to reclaim the importance of intelligent ecology in 21st century urbanism. Looking at individual small towns and city-states that arose throughout history—from Greek city-states, such as Miletus and Samos, to the towns populating the Roman Empire, to the Renaissance fortress city of Palmanova—it is notable that each of these urban systems were developed with a degree of autonomy and independence that is impossible in today's globalized era of the nation-state. For centuries, towns and city-states developed idiosyncratically, as micro engines of cultural, agricultural and social sustainability; their often remote locations and distinctly defined urban boundaries led to highly specific architectural, urban, economic, and social considerations as each culture addressed the questions unique to its own advancement. In the 20th century, beginning with Ebenezar Howard’s Garden City, one can easily trace the rapid integration of technology and social change through Le Corbusier and Team 10’s urban masterplanning proposals, to the fantastic cultural re-inventions and destinations of Archigram, to the ecologically-driven agenda of Louis Kahn’s car-free downtown Philadelphia, to Norman Foster’s Masdar City. Now, China is poised to inherent this legacy by constructing a 290 hectare island that will become a laboratory and demonstration project of urban sustainability in Hainan, China. 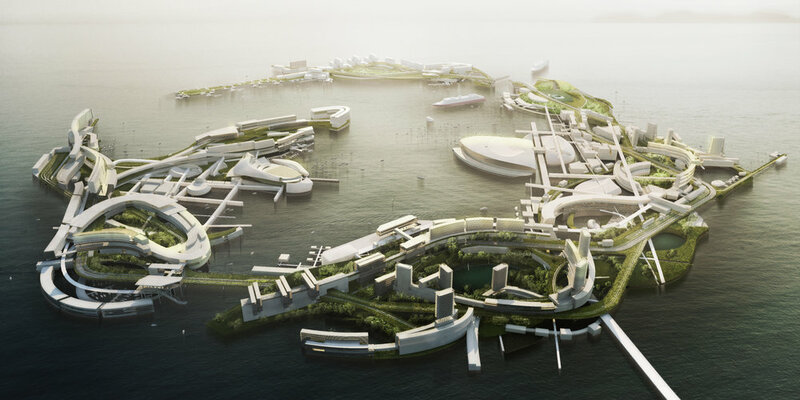 Studio targets the issue from five approaches, they are floating landscape, Archipelago, Infrastructure Urbanism, Extreme man-made urban environment, and the pods. Land Reclaimation is the number one enemy to many living organisms and the eco-system we live in. Meanwhile, artificial Islands has proven to be a popular development ideal for many developers seeking to invent a new world. The conflict between these two issues bring about the concept for floating landscapes, which suggest zero reclaimed land while constructing an artificially floating island. With a small environmental footprint the islands can work to enhance the eco-system, while creating a new ecology of its own. The proposed is a natural floating island chain that challenges the ecology of the ocean is explored through the lens of programming and differentiating between passive and active water ponds. We wanted to explore different notions of recreations which the landscape within each island follows a piazza format. The big organizational strategy is the main island clusters and the pedestrian and bike bridges that work as a secondary connection in our island. The Hainan south sea pearl man-made island provides an unique opportunity for architects and urban designers; no context, no history and no land - a carte balance. Such an unique opportunity allowed us to explore the fundamentals and necessities of the urban environment in our search to create a non-conformist multi-layered island experience. Haikou is on the northern edge of the torrid zone, and is part of the Intertropical Convergence Zone. April to October is the active period for tropical storms and typhoons, most of which occur between August and September. May to October is the rainy season with the heaviest rainfall occurring in September. Despite its location, the city has a humid subtropical climate, falling just short of a tropical climate, with strong monsoonal influences. The island is a purpose for a platform that suits a dynamic, everchanging urban environment. It takes the sometimes fixed and unfixable master plan and breaks it down into small fragments that change in scale and program. By doing so, the small fragments, pods, can use the water of the island as infrastructure and to be dynamic. Moreover, it changes the common conception of what is moving and what is fixed in the urban fabric.